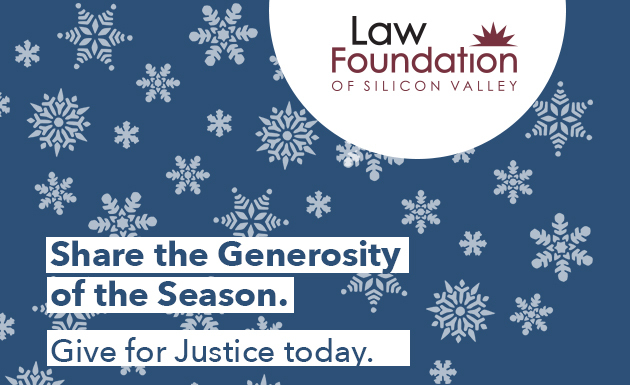 Law Foundation of Silicon Valley | This Season of Giving, Give for Justice! This Season of Giving, Give for Justice! Donate to the Law Foundation to make an impact on the everyday lives of children, youth, families, seniors, people living with mental health disabilities, and others who are vulnerable to losing safety and stability — whether it's their home, benefits, health care, or access to fair education. How Much Would You Like to Donate This Holiday Season? Donate 100% - Add 3% so that 100% of the donation goes to Law Foundation of Silicon Valley. Law Foundation of Silicon Valley has partnered with Network for Good to securely process your online credit card payment via Network for Good (tax ID 68-0480736). This transaction will appear on your credit card statement as "Network for Good." This transaction is subject to Network for Good’s Privacy, Security & Disclosure Statement and the Charitable Solicitation Disclosure.